Home / Landscape / Bristol to get proper cycling infrastructure? Bristol to get proper cycling infrastructure? Plans to bring fresh cycling infastructure to Bristol look set to go ahead after the City Council gave a thumbs up to the Bristol Cycling Campaign’s ‘tube map’. Public consultation on the idea is now set to take place early in 2014, with plans potentialy signed off by Mayor George Ferguson by spring. The campaign body has descirbed the news as a ‘significant step’ towards their goals to acheiving a safe cycling network, both in the city centre and out as far as Bath and Yate. Mark Bradshaw, assistant mayor for transport, planning, strategic housing and regeneration, told the Bristol Post: "We are producing a new cycling strategy and have been working with Bristol Cycling Campaign on plans for the strategic cycle network for the city. "We are aiming to consult on proposals this year for a launch in early 2014, which will include many of the issues highlighted in the campaign group’s manifesto. 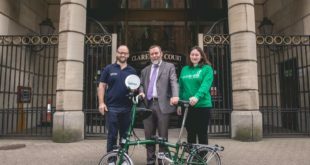 "There are more than £10 million of new cycling measures in the council’s cycling programme, including the new cycling ambition fund to improve cross-city and river links. We will continue to work with the campaign group and other stakeholders in delivering a comprehensive network for Bristol." The source of the funding for taking the project forwards is yet to be determined, with an estimated £109 million needed to bring about the suggested BCC network. Local media The Bristol post and Road.cc have more on the news.